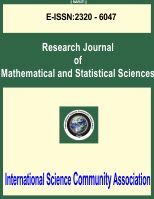 International Science Community Association are publishing an international peer reviewed journal Research Journal of Mathematical and Statistical Sciences . It is the vision of International Science Community Association to publish research papers, research articles, review papers, mini review, case study and short commutations in all areas of human study without financial restriction. Coverage Area: Researches in the field of Mathematical and Statistical Sciences including algebraic, linear and multilinear algebra, geometry, geometry and its applications, simulation, optimization, statistics, statistical mechanics, multivariate statistical analysis, probability, algebraic statictics and its applications, structure of matter, measure and integration, differential geometry, partial and ordinary differential equations, quantum theory, differential geometry and Integral equations, computational algebra, algebra and mathematical logic, mathematical programming, mathematical computer sciences and numerical analysis, mathematics modelling and optimization, computational group theory, calculus of variations and optimal control, matrix theory, general, special and real functions, topology, operations research, and theoretical developments techniques, etc.